It is important to apply the correct protective coating to the rubber keypads surface based on the product usage. Rubber keypads protective coating has Epoxy Coating, PU coating, Silicone coating. These coating are available in both matt and glossy finished as per application requirement. Silicone keypad with Epoxy coating will give it a plastic appearance, as well as enhance the durability of surface printing. 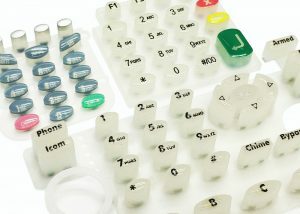 PU / Silicone Coating could increase the keypads lifecycle which can also preserve the product by helping to reduce dust. This type is applicable to products with backlighting. Translucent keypads tend to discolour over a period of time and our special treatment helps to maintain the original tinge.